Late goals from Mohamed Salah and Jordan Henderson secured yet another crucial victory for Liverpool in the title race after coming from behind in the first half. A fourth consecutive league game without a clean sheet, but Alisson could do nothing for the opening goal as Shane Long converted from point-blank range. No real saves of note to make thereafter, and kept things simple and risk-free in terms of his distribution here after a shaky performance against Tottenham last time out. 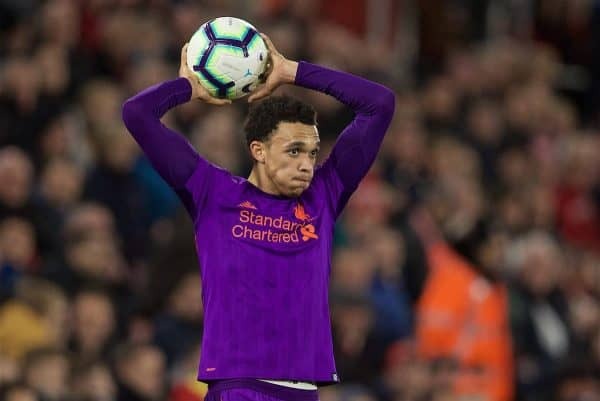 A mixed first half as Southampton frequently exploited the vast space down Liverpool’s right-hand side as Trent was stationed very high up the pitch. Going forward, he was a constant outlet and delivered a trademark quality cross into the box for Naby Keita‘s equaliser for his 7th assist of the season. Overall though, he struggled defensively and Southampton certainly targeted his side. Substituted for Milner for the final half hour, with Klopp saying post-match that the teenager was “feeling the effects of the season”. A little slow to react at times and was physically outfought on a couple of occasions in the first half. Produced one of his speciality driving forward runs to launch an attack, but could have used the ball better overall. Made a superbly timed, vital tackle to dispossess Redmond in the box early in the second half to deny a potential goal scoring opportunity. Still, some nervy moments too. Dragged out of position for Southampton‘s opening goal by Pierre Emile Hojbjerg’s clever run into the box, but made several vital interceptions when Liverpool’s backline was exposed repeatedly in the opening stages. Almost diverted the ball into his own net at one stage, which turned out to be an important clearance – and was fully in command of the back line in the second half as Liverpool tightened up as a unit at the back. Not fully switched on to the situation when Long opened the scoring and was caught on his heels at the back post. Delivered a dangerous cross which was cleared in the passage of play which eventually resulted in Keita’s equaliser. As ever, showed endless endeavour driving forward down the left as a key component of Liverpool’s attacking play, but ought to have put the ball on a plate for Mohamed Salah late on as he badly overhit his cross from a prime position. Didn’t do an awful lot wrong on an individual level in the first half, but was part of the midfield unit which struggled to gain a foothold and control the game, and was a little sloppy at possession at times. Easily dribbled past by Nathan Redmond early in the second half and generally wasn’t able to impose himself on proceedings in the manner he usually does. Always had his head up looking for the forward pass, however, which contributed to Liverpool hauling their way back into the game after a ragged start. He certainly improved after the subs, with more support in midfield. Wijnaldum has been a standout performer in midfield for much of this season, but this was more akin to his previous performances which gained him a reputation for disappearing away from home. He was pretty much anonymous in the first half and appeared sluggish and tired on the ball- perhaps a result of the sheer volume of minutes he has played this season starting to catch up with him. Replaced by Henderson for the final half-hour, with Klopp again saying that the Dutchman was feeling the effects of the season – which certainly seems to be the case. He’s played 1,000 minutes more than Henderson or Fabinho and is also a regular for his national side. Needs a break. Starting in the league for the first time since early February, Keita stepped up to score his first goal for the club at a crucial moment in Liverpool’s season, heading the equaliser past Angus Gunn from close range. He was unfortunate not to win a penalty when he looked to have been tripped inside the box by Maya Yoshida who didn’t get any of the ball, despite the contact being fairly light. Played a clever chipped pass to create a good chance for Roberto Firmino, and overall made a significant contribution to another remarkable show of resilience by Liverpool under enormous pressure to find three points from somewhere. A potentially momentous moment for Keita on an individual level, Klopp will be hoping the goal finally gives him the confidence to express himself now on a more regular basis. Involved, but not particularly effective for much of the game- as has been the case for several weeks now, up until the moment where he became the game’s most decisive player. Picking the ball up on his own inside Liverpool’s own half, Salah ran the remaining length of the pitch himself with others chasing in pursuit, this time finding the ice-cool composure to slot the perfect finish past Gunn to put Liverpool in front. 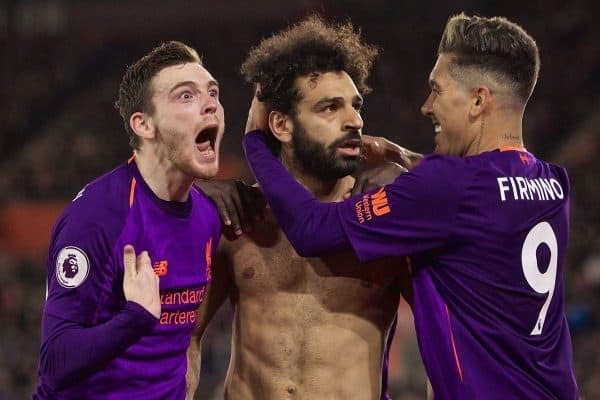 Not only was it Salah’s 50th Premier League goal for the club- the fastest player to do so for Liverpool- ending his eight-match drought, but it was also one which could well prove season-defining. The celebrations showed just how much it meant to him. Found himself in several highly promising goalscoring positions, but just couldn’t quite get his shot away cleanly enough in several situations. 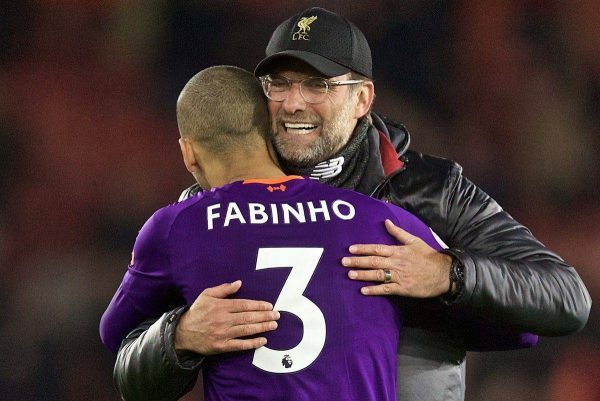 His defensive heading from set pieces was highly impressive, and Firmino showed brilliant awareness and technique to hold the ball up and wait for the perfect moment to feed Jordan Henderson for the goal which secured the three points. An understated but integral component in Liverpool’s comeback; both up front and defensively with some important headers inside his own box. Unusually subdued during the first half but came alive after the break and looked like Liverpool’s most dangerous attacking threat. Created an excellent opportunity for Firmino with a driving run and precise cut back which the Brazilian could not convert, and was constantly looking to take his man on and get himself into the box. 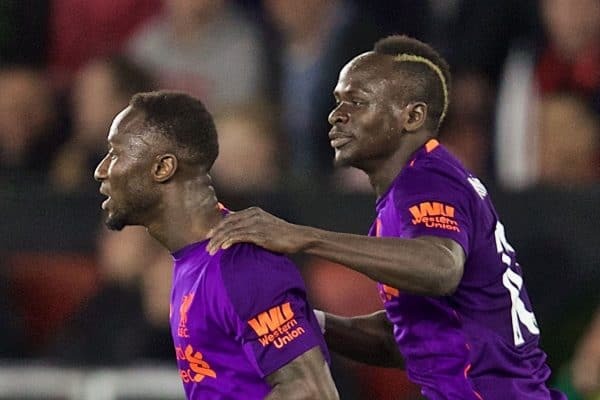 It didn’t quite come off for him in terms of scoring or assisting here, but Mane’s attitude and willingness to take risks to create openings and force errors from Southampton‘s back line was key in switching the momentum back in Liverpool’s favour during the second half. Not a surprise substitution at the time, but to see him replace Trent was unexpected. Some poor corner deliveries were frustrating, but Milner was determined to get Liverpool on the front foot and keep stretching the play, helping turn the screw in search of the late winner which eventually arrived. 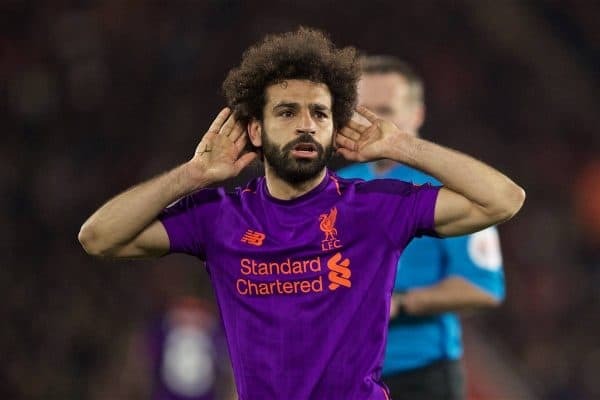 Forever polarising in terms of fan opinions, the captain’s introduction proved pivotal as he won the header which released Salah for his goal, and timed his forward run into the box to score his first of the season, wrapping up the victory for his side. Near enough the perfect cameo performance. Not involved in any late drama as Klopp looked to sure things up at the back in the closing stages. Having selected the midfield trio many fans have been calling for the manager to pick, Klopp surely cannot have expected his side to be so open and disorganised in the first half as Southampton walked through at will at times in the opening stages. Choosing to keep things the same at the break, Klopp was clearly unhappy with Liverpool’s start to the second half and promptly took action, making a double change much sooner than he usually does in these scenarios. The decision to bring on both Henderson and Milner, his most trusted senior figures, was justified as Liverpool managed to crank up the pressure and pin Southampton back in search of a winner. 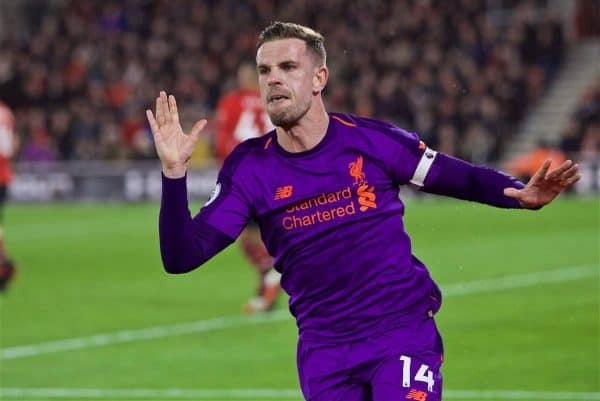 Henderson’s goal and assist proved particularly decisive, and Klopp will be thrilled with the manner in which his players responded in the face of adversity yet again to find a way to win when it looked as if it might just not happen. 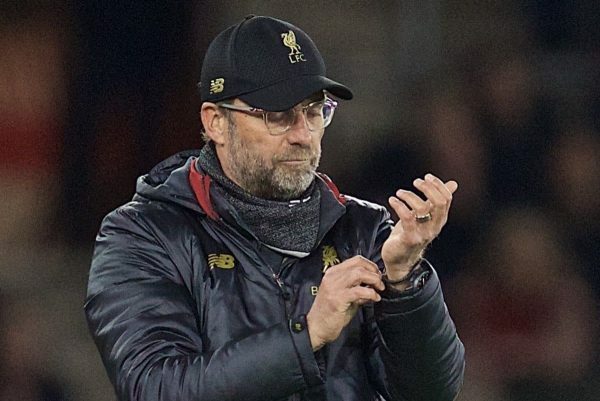 To get both Spurs and Southampton out of the way with six points in the bag will delight Klopp, and it puts Liverpool in a prime position to strike should Man City drop any points as they enter a tough period of upcoming fixtures.